April Daring Baker’s Challenge – Cheesecake Pops! Daring Bakers – the name just makes me giggle! And the logo? Fab! I was so excited to join this nifty group of amazing bakers from all walks of life and types of kitchens. It’s a group of bakers who all participate in a monthly recipe challenge, then post about their success or struggles with the recipe. Just my sort of thing. Hey, I bake without gluten and dairy! I am already daring! Woo! So, the day arrived. I received my invitation, I signed on and checked for my first challenge. Would it be some sort of fabulous rustic roasted garlic olive loaf? A yeasted sweet roll? They had just done a beautiful party cake and lovely baguettes the months before. Maybe a cream puff, a ‘la “cream puffs in Venice”? I clicked on the window and saw, um, Cheesecake Pops. Did I mention I am dairy and gluten free? Cheese. Cake. Hmmmm…. Maybe this Daring Baker thing is REALLY going to be more of a challenge than I thought. But a good cheesecake recipe is never a bad thing to have under your belt, unless it makes it difficult to buckle that belt! And the photos of the cute little pops (little bites of cheesecake on a stick, dipped in chocolate and covered in sprinkles) were adorable! You know I can’t resist cute food! I’ve made tofu based cheese cake before, back in our vegan days, and it was okay, but I knew it could be improved, maybe with the tofu based mock cream cheese. Also, what about soy? It’s high allergen and I wanted to see if a non-soy based cheesecake was possible. So, I started my challenge deciding to run through it with the cream cheese substitute first, than try to find another substitute without soy. For my soy free version I wanted to try to use my coconut yogurt to make a “cream cheese” and for the soy version I simply used Tofutti brand soy cream cheese. They both turned out very creamy and delicious. I used a bittersweet chocolate as a counterpoint to the creamy filling and really enjoyed how they turned out. They were not too difficult to make, mostly just a bit time consuming with the different chilling/freezing times. They will be something we will make again for a special occasion, as they were delicious and so very cute. My kids loved them, my mom (the cheesecake queen) thought they were delicious (I have to hide them now! ), and my husband (who DOES NOT like cheesecake) decided this wasn’t so bad especially with the chocolate coating it. My dad is even bringing a couple to work. He likes to sometimes show people that gluten and dairy free doesn’t mean you have to be deprived of tasty fun. I am so glad I joined this group! If this month’s challenge is any indication, I have a lot of fun to look forward to! Thanks, everybody! Scoop one batch of coconut yogurt into a strainer lined with cheese cloth. The strainer should be over a bowl to catch the liquid “whey” that will drain from the yogurt. After a couple of hours, I tie the ends of the cheese cake to a wooden spoon and place the wooden spoon on the top of a water pitcher, suspending the yogurt inside the pitcher. Secure the handle of the spoon to the pitcher’s handle with a rubber band. Cover with plastic wrap and refrigerate for 8-24 hours depending on the desired consistency. The longer the yogurt sits, the thicker the yogurt cheese. Allow 1 cup of yogurt for every 1/3 cup of yogurt cheese. Coconut yogurt cream cheese, unwrapped! Original recipe from Sticky, Chewy, Messy, Gooey by Jill O’Connor – altered to be gluten and dairy free by me. This is my half batch pan set up in the water bath. When the cheesecake pops are frozen and ready for dipping, prepare the chocolate. In the top of a double boiler, set over simmering water, or in a heatproof bowl set over a pot of simmering water, heat half the chocolate and half the shortening, stirring often, until chocolate is melted and chocolate and shortening are combined. Stir until completely smooth. Do not heat the chocolate too much or your chocolate will lose it’s shine after it has dried. Save the rest of the chocolate and shortening for later dipping, or use another type of chocolate for variety. Alternately, you can microwave the same amount of chocolate coating pieces on high at 30 second intervals, stirring until smooth. Your pops look great! Always thrilled to see other Alternative Daring Bakers! I am always so impressed when people have to make such alterations. Great job – they look wonderful!! 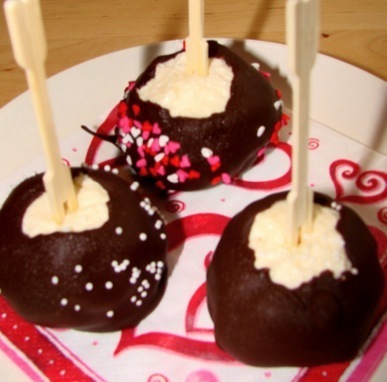 You did a fabulous job on your cheesecake pops. 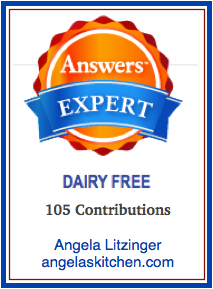 You so rock…another DBer who made their own dairy or nondairy products this month. We’re definitely getting to be a wildly creative bunch. Welcome to the Daring Bakers! The Alternative Daring Bakers have a bake together each month. Send me an email if you’d be interested in baking along with us. Very nice, I’ll have to try the coconut yogurt cream cheese. Very impressive! 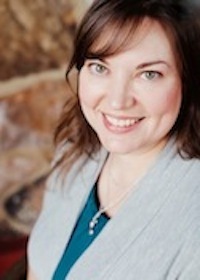 Welcome to the group Daring Baker!